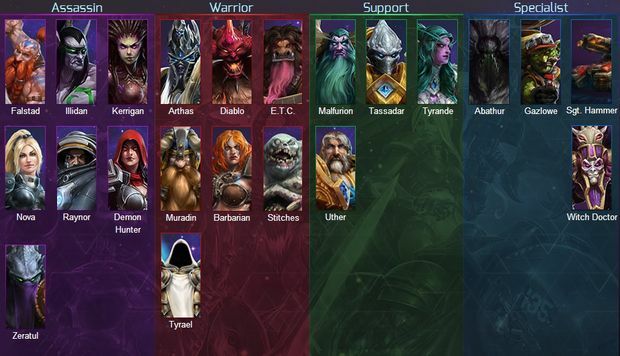 The "Technical Alpha" (read: really rough early version) for Blizzard's upcoming MOBA Heroes of the Storm has started. 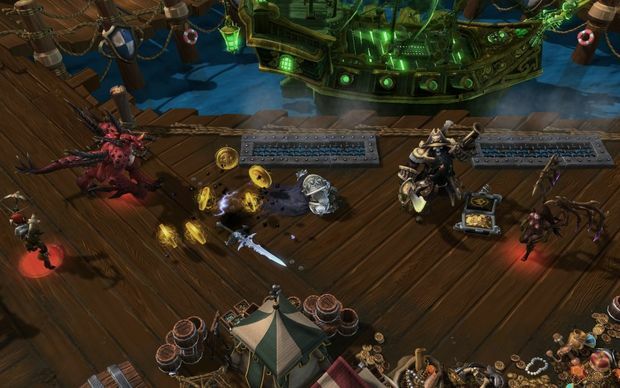 What was initially known as "Blizzard Dota" many moons ago has become something else entirely, with heroes and villains from Warcraft, StarCraft, and the Diablo franchise duking it out in arena combat. Of course, Blizzard doesn't prefer the term "MOBA" -- rather, "Hero Brawler." It's still totally a MOBA, and I'm going to tell you why I'm excited for it, even in this early playable state. 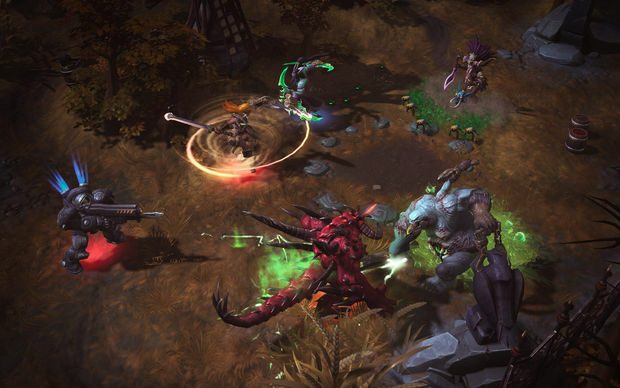 Heroes of the Storm starts off with a light-hearted tone and never lets up. The story begins with StarCraft hero Jim Raynor getting sucked up into the "Nexus," where he's introduced to Warcraft's Uther the Lightbringer. After a few "Nexus? What is this a Protoss joint?" jokes, Uther shows Raynor the ropes of how to move in a MOBA, point-and-click style. What I love most about the tutorial is that it's perfectly paced, and doesn't let up on the corny jokes. "Diablo, we've been over this a million times. You can't taste fear!" Slowly but surely you'll learn how to use each of your hero powers (more on that later), as well as the concept of cores, towers, and minions. Just like any standard MOBA there are three lanes, with "checkpoints" of towers and gates to clear out, with waves of minions pouring through each lane to destroy and push. The beauty of Storm's formula though is that it trims out a lot of the fat in favor of a more action-oriented experience. The main difference compared to the rest of the genre is that Heroes is built on speed. You don't really have to worry about last hitting minions -- hell, you don't even have to worry about gold and items. Towers can even run out of ammo temporarily allowing you to smash them into bits. You can also recruit neutral camp minions, as well as do crazy Mario Party-like events such as paying a pirate crew to shoot enemy structures. Many core hero abilities are also built around the utter destruction of minions, allowing you to clear them out quickly. If you've ever wanted to get into a MOBA but have hated the concept of having to do a million other things to keep up with pros while leveling, Heroes is your huckleberry. Let's take a look at what Raynor has at his disposal: a cone-based shotgun blast, a buff for him and his allies, an auto-heal passive (that enacts, or "procs" when he's low on health), and an Orbital Strike (his ultimate) that moves in a line. That's really all you have to manage, and many of the other heroes are the same way, with lots and lots of passives that you'll earn after your ultimate (presumably to make up for the lack of items). Everyone also has a mount to keep them in the action and get around quickly -- in case you're wondering, it's really funny to see Diablo riding around on a horse -- as well as your standard "teleport back to base." So how does the free-to-play element work? Well right now in the Alpha, you can spend in-game currency or real-life money -- the latter of which Blizzard will refund with "credits" for you to use once the real thing starts. Everything else works just like League of Legends: there's a free rotation of heroes to use, and you can buy more to unlock permanently if you wish. 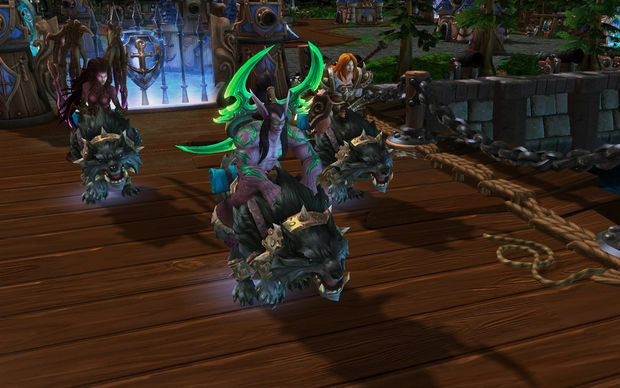 There are also skins to buy (for you and your mount) just like LoL. Here are all the characters that are currently live in the technical Alpha: Stitches, Arthas, Diablo, Tyrael, E.T.C. (Tauren), Barbarian, Muradin, Kerrigan, Nova, Falstad, Demon Hunter, Illidan, Raynor, Zeratul, Tychus, Uther, Malfurion, Tassadar, Tyrande, Witch Doctor, Gazlowe, Abathur, and Sgt. Hammer. It's really tough to judge the overall economic situation of the game right now, so as time goes on, let's just say I hope Blizzard keeps pricing fair -- or you'll be hearing about it. At the moment, I feel like some things are overpriced, but again, this is an Alpha. The bottom line is Blizzard fans will love the idea of pitting their favorite characters against each other. Some of us have played their games since the very first Warcraft in 1994, and I'm really glad that they decided to make the setup as fanservice-oriented as possible. Expect more coverage as the Alpha evolves and updates, as well as a full review once the game is actually out.